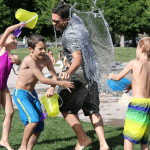 Do your young children love pretending? Children are often inspired by imagining and doing. Believe it or not, pretend play is not only fun, but it builds learning skills in essential development areas. Gifts that encourage pretend play are guaranteed to provide hours of entertainment and nurture their imagination all throughout the year. There is no “right” or “wrong” way to play with these toys. Finding these gifts underneath the tree are sure to surprise and delight children of any age! Pretend play is such a huge milestone for our kids, and it’s our goal to give them the tools they need to expand their imagination. 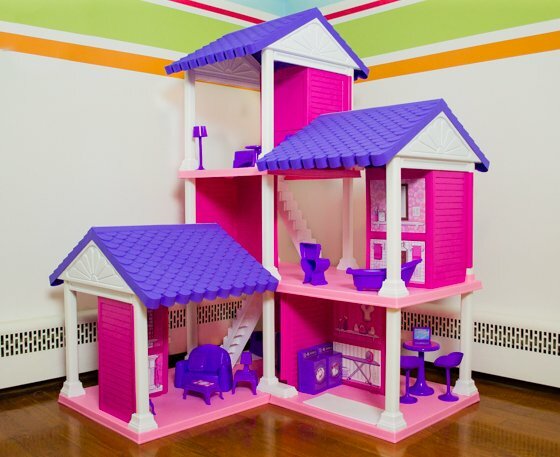 With the Fashion Doll Delightful Dollhouse, your little girl can do just that. 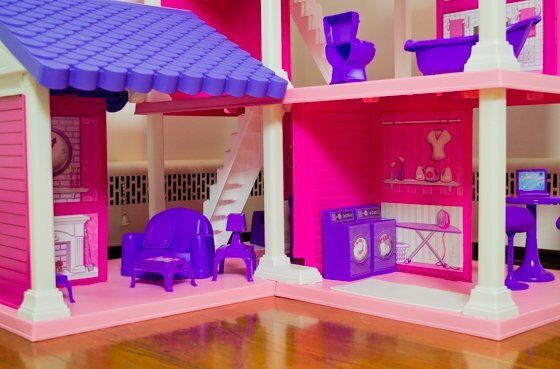 This dollhouse has numerous floor plans, sticker decals to decorate each room, and is accompanied by 25 furniture accessories, so your girl can be both architect and interior designer. Suited to fit any 11 1/2″ dolls, the Fashion Doll Delightful Dollhouse can be home to any number of dolls your girl has in mind. With its 360 degree access, it is the perfect piece to play with friends. The Fashion Doll Delightful Dollhouse requires full assembly. Dolls are not included, but will fit any dolls up to 11 1/2″. With a manufacturer like American Plastic Toys, you are guaranteed to be purchasing a product made in the United States. There’s nothing more classic than the gift of a baby doll on Christmas morning. From the moment your children’s eyes fall on that doll, they have found a childhood friend. 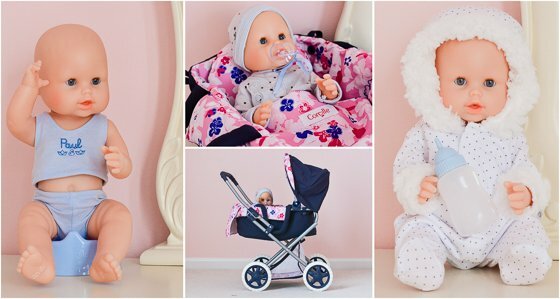 If you’re looking for the perfect doll for your little one this year, look no further than Corolle. Over the last 30 years, Corolle dolls have been finding their way into children’s hearts and stirring their imaginations. These are no ordinary dolls. Designed in France, impeccable thought is put into every last detail of these lifelike dolls. With durable, vinyl bodies, beautiful eyes that open and close and the sweet, subtle smell of vanilla, these dolls will make a lasting impression on your little ones. There’s a wide variety of Corolle dolls and accessories to choose from, so it won’t be difficult to find the perfect set for your children. 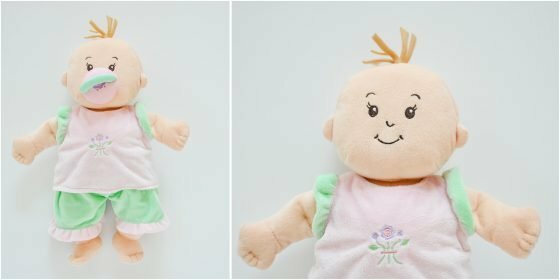 With 5 types of dolls, each specifically designed for the ages of your children, you can begin their Corolle doll collection from the day they are born. For ages 3 and up, the Mon Classique dolls are designed to encourage major developmental activities in children. The Mon Classique Paul and Emma Drink and Wet Bath Babies come with their very own potty chair. Each doll is anatomically-correct and arrives wearing a pair of underpants instead of a diaper. These dolls can be taken in the bathtub, and will become a great aid in the potty-training experience for your child. You can also choose from a variety of special fashion-forward clothing for your Mon Classique doll. The grey star pajamas and cap set is a perfect addition to your little one’s Corolle doll wardrobe. And your child will love dressing his Corolle doll in the white snowsuit for outdoor winter adventures. You’ll definitely want to add the Mon Classique Carriage to your child’s gift. 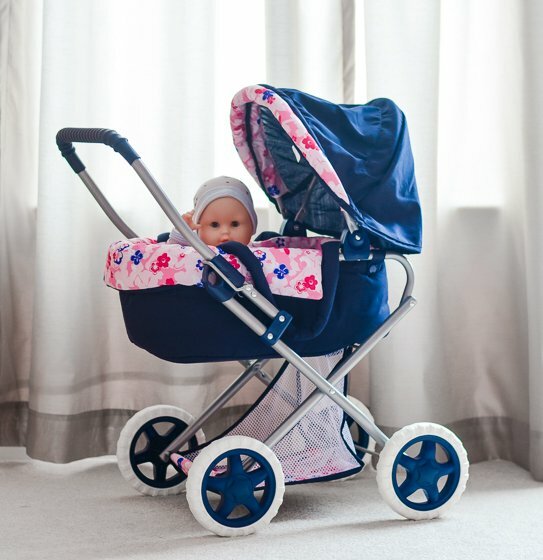 This carriage is perfect for imaginative “mommy” and “daddy” play, and comes complete with a removable bassinet and under-carriage storage for all of their baby’s essentials. Are you looking for an inspiring gift for your creative preschooler? Encourage imaginary play with this sweet fairy cottage by Chasing Fireflies. This beautiful fairy cottage looks as if it came straight out of a fairy tale! 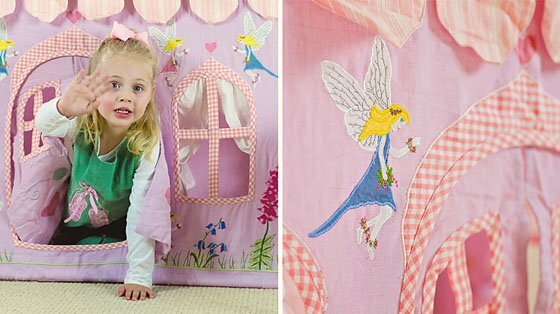 Made of handcrafted quilted cotton canvas, your little girl will find her new cottage perfectly charming; with cute appliques, finely stitched embroidery, gingham trim and frilly curtains. 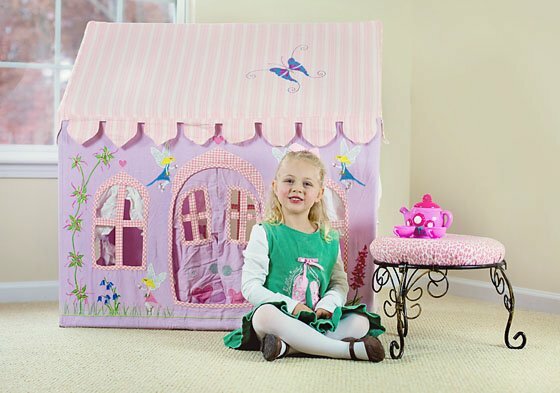 The design of this indoor play tent is absolutely adorable with pretty colors and whimsical fairies. Using the light-weight aluminum piping and connectors, simply follow the directions to piece together the frame. Then tightly fit the one-piece cottage walls around the frame and secure the velcro edges. The doors and windows can be secured to the side with attached curtain pull backs so she can look out, or left down so she can have her own private tea party. It’s the perfect space for your child’s imagination to go wild! And while it does take up quite a bit of room, this cottage also includes a storage bag just in case you need to put it away. There’s nothing like your little girl’s first baby doll, and Baby Stella is the ideal choice. Made from the softest plush fabric with no plastic parts, and with a sweet, expressive embroidered face, your daughter will fall in love with Baby Stella. From the moment you pick up Baby Stella, you’ll realize she’s a cut above the rest. Her sturdy weight and stitching will stand up to years of play, and our favorite feature is the magnet that’s behind Baby Stella’s mouth. Her pacifier is magnetized, and it pops right onto her face with ease (as do some of the optional accessories such as her bottle). Stella’s clothing is completely removable with velcro fasteners, including her diaper, so your daughter can jump right into getting Stella dressed, and changing her diaper. Little girls love to play “mama & baby,” and Baby Stella is the perfect baby doll that will grow with your daughter over the years. Along with the Baby Stella Doll, your little one will love playing “bath time” with this plush bath set by Manhattan Toy. 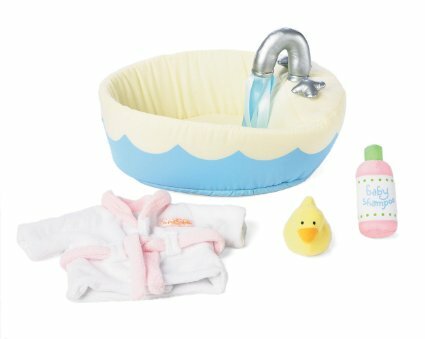 Perfect for children of many ages, this soft set includes a robe, stuffed ducky with squeaker, stuffed shampoo bottle, and a molded soft tub with ribbons that look like water coming from a faucet. This set promises to promote role play and imagination and delight your little one as they pretend to give their Baby Stella Doll a bath. 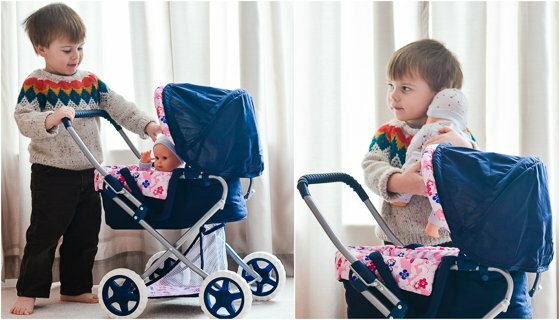 Encourage a nurturing spirit in your child as they learn to care for others through caring for their Baby Stella Doll. Your little one is enamored by anything with four wheels and a heart fueled by speed. Various sizes of cars, trucks and trains sit in every nook and cranny of your house – most forgotten after the initial excitement wears off, or abandoned due to missing wheels or battery malfunctions. But once again, vehicles of any variety claim the number one spot on his Christmas list this year. What’s a loving parent to do? You want to see his eyes sparkle as he opens his gifts on Christmas morning, but you don’t want another cheaply-made gift that will top off the “abandoned” pile in a few weeks. The NameTrain Town Train Set by Maple Landmark will fill his wish-list desires and become his most cherished possession, taking center stage in his playroom for years to come. 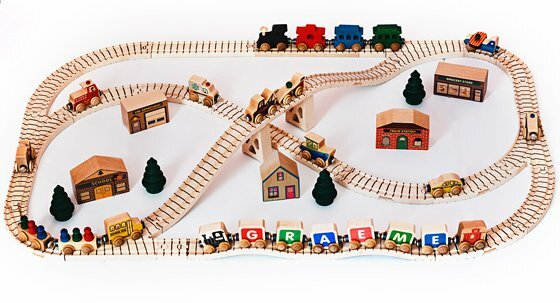 Made on-site in Vermont, the tracks of this beautifully crafted 56-piece train set are made from locally harvested maple wood. The set includes track pieces to make a 24″ by 38″ railway-surrounded town, complete with all of the essential town buildings, vehicles, trees, bridges and trains. The best part is, the tracks to this railway are compatible with other wooden train systems, like Thomas The Tank! The NameTrain Town Train Set will provide your little one with hours of entertainment as he brings his railway town to life before his very eyes. If you want to start simple, and build your child’s town slowly, you can purchase smaller railway sections and town accessories, individually. And if you really want to make his NameTrain Town Train Set special, you can create a customizable NameTrains, where each letter in his name acts as a train car, magnetically connecting to each other and an engine and caboose! 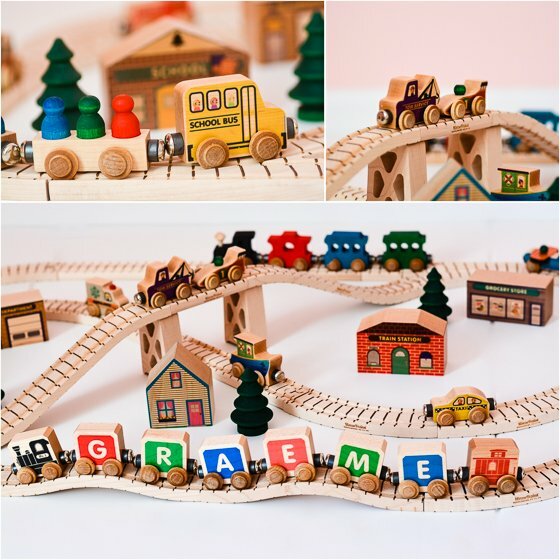 You can choose from a variety of letter styles to create a uniquely personal train for your little one. Little kids naturally love copying Mom and Dad and always want to help out when they can and try to play along. 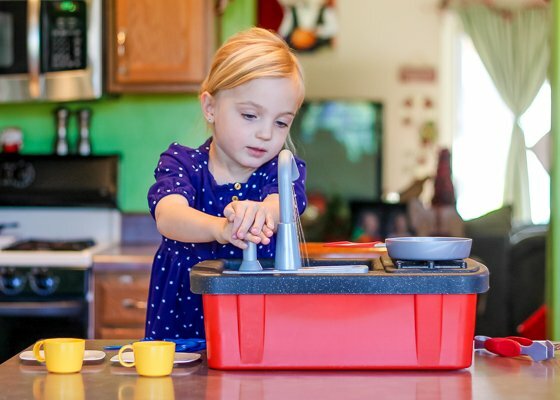 With the new Little Tikes Splish Splash Sink and Stove kids will have plenty of hands-on fun! If you have ever had your child want to help you wash dishes, but were afraid of the mess, now you can let them easily help you by setting up this adorable mini-sink and stove set. 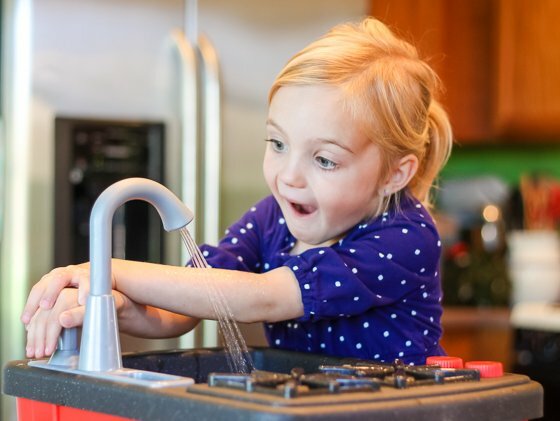 With the real working faucet, kids can really wash dishes, just like a grown up! 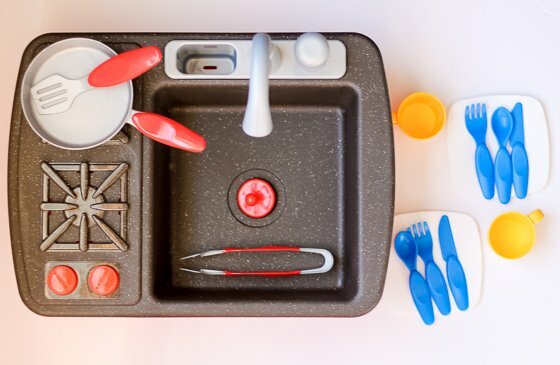 This super fun sink comes with 13 accessories that include pans, dishes, utensils and cooking tools so your child can take make-believe to a new level with the clicking burners and real, working faucet! By filling up the tub below, your child can really pump water from the faucet so they can play and wash dishes just like a grown up. 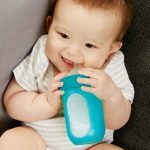 The pump is easy to use too, which is great for little ones, and for even more fun, you can add some soap and make bubbles for them! These types of pretend play toys help to encourage a child’s imagination and creativeness. The possibilities are truly endless with this fun set and your over 3 year old will absolutely love this hot holiday toy and will get hours of fun and entertainment out of it, either inside or out! 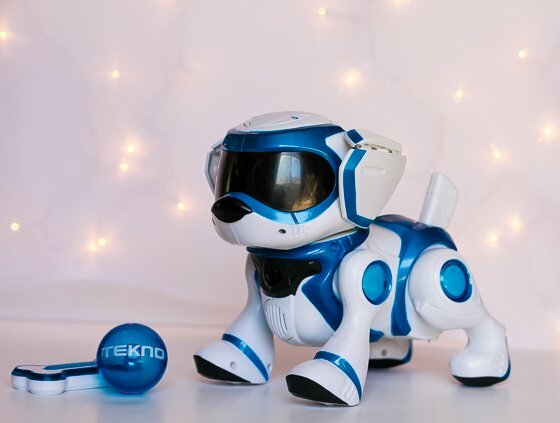 Technology meets loving pet with the new Tekno Robot Puppy from One Step Ahead! This incredibly fun doggy is among one of the hottest trends in toys this year. This amazing robot dog can not only walk, bark, and sleep like a real puppy, but he will even obey your child’s voice and hand signals! He can perform tricks on command like sit, stop, and flip and will even respond when kids pet him by wiggling his ears. Just like a real dog, Tekno needs to be taken care of so he comes with a bone that your little ones need to use to feed their puppy everyday to keep him healthy. He also loves to play so he has a ball that he can really carry in his mouth and has flashing LED lights that tell you how he’s feeling. This dog is so much fun, your kids will love him! One of the most fun parts of this dog is the free app that you can download to take the fun even further! With the app that’s available for iPad and android tablets, children can make their puppy nearly come alive! You can make your puppy sing and dance, or change how often he barks and how far he moves, or you can digitally feed him or call some of his puppy friends to talk! Kids will love how much they can control with this dog- it’s almost as if he’s a real puppy, without all of the mess! 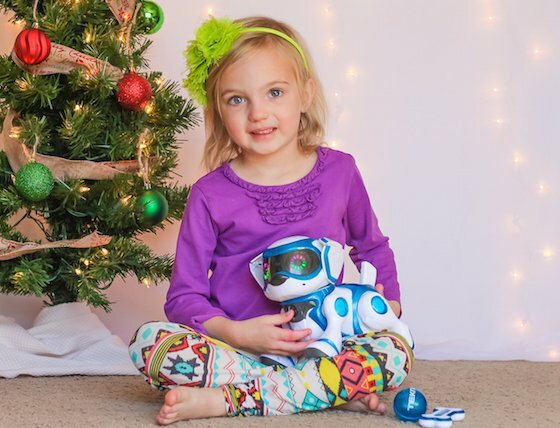 Designed for ages 5 and up, Tekno Robot Puppy will be one of the most fun, engaging and exciting presents that’s under the tree this year! 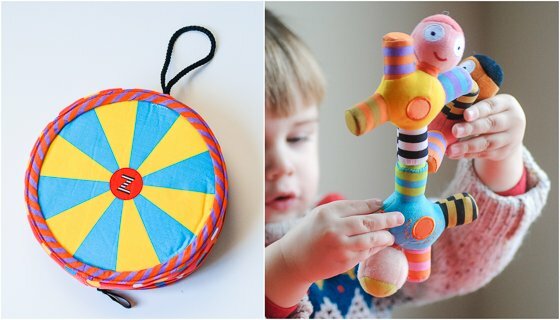 If you’re looking for a truly unique toy for your little ones this holiday season, Zolo Stacrobats by Kushies fits the bill. 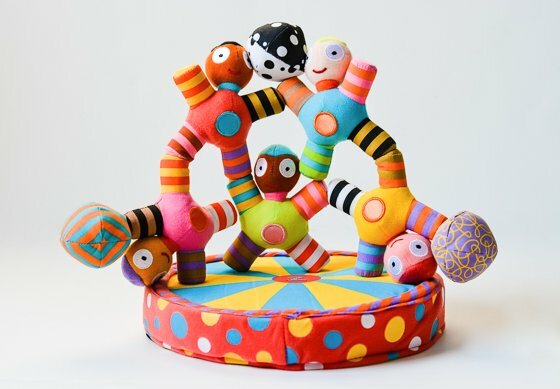 Complete with five colorful magnetized dolls and three balls, you kids will have hours of fun stacking them in various positions and creating their own team of acrobats. 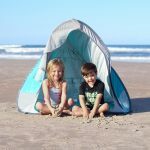 Zolo Stacrobats are the perfect gift for children one and older. 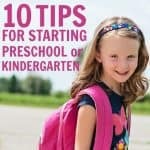 Younger children will have fun simply playing with the dolls, while older kids will master balance and stacking skills, all the while being encouraged to play imaginatively. Their circus of acrobats will come to life before their eyes! When they are done playing, they can toss all of their acrobats and balls in their own carrying case for safe keeping or travel. Made with durable, quality materials, the Zolo Stacrobats will “perform” in your home for years to come! 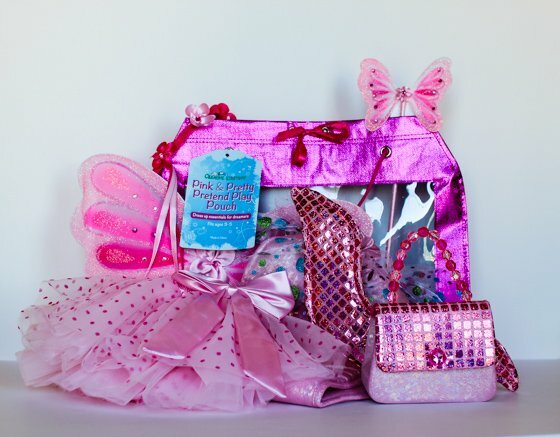 Make this holiday season extra sparkly and magical for a very special little princess with the Pink & Pretty Pretend Play Pouch. Whether she chooses to pretend she is a fairy, a mermaid, a butterfly, or a princess, this pouch contains the perfect items for her to be imaginative and creative. What could be a better gift than inspiring educational play that brings with it beautiful childhood memories? 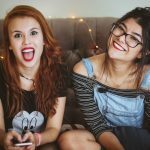 Creative Kidstuff also gives part of the profit they make to charities, such as Sensational Beginnings, GreaterGood, and Soles4Souls. 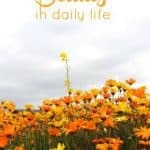 So not only are you benefitting your own child, you are also helping other children’s dreams grow, too! 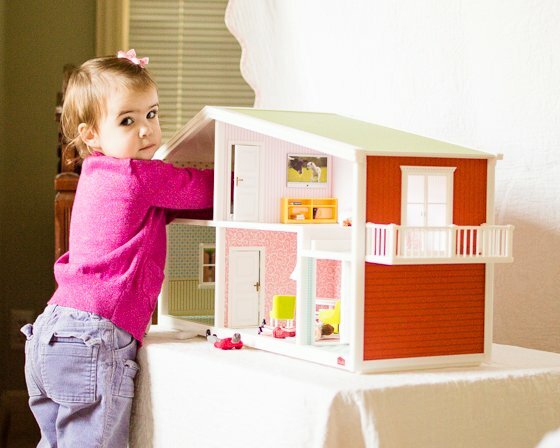 If you have a little girl or boy that loves pretend play, the Lundby Smaland dollhouse and accessories will take your child’s playtime to the next level. If you’re looking for an all-in-one package, the Smaland Mega Starter Pack is the way to go–you get the most savings and all you need to fill the dollhouse in style. The mega starter pack includes the Smaland doll family, the brass bed set, the tv and furniture set, the stove and fridge set, the dining room set, 2 floor and ceiling lamps, and the bathroom set. What really sets the Lundby Smaland dollhouse and accessories apart from other dollhouses are the details. 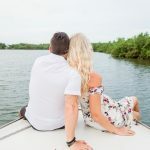 The house comes prewired for lighting and accessories such as the bathroom and bedroom sets include small removable pieces such as throw pillows, a toothbrush in a cup, and tiny perfume bottles. There are even seasonal accessories such as a Christmas tree that you can purchase separately, as well as a dog with two puppies, and even pots, pans, and kitchen condiments. 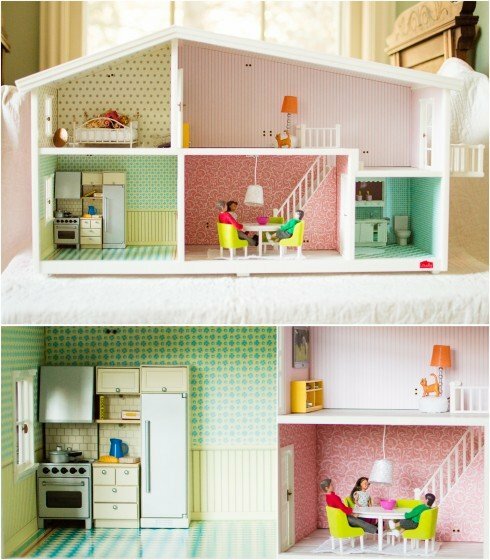 Do yourself a favor and invest in a dollhouse that can grow with your child’s interest and is built to last. 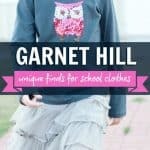 An integral part of pretend play is playing dress-up, and what better way to do that than with all of the dress-up clothes contained to one place? Ace Baby’s Mobile Closet will help consolidate storage of all dress-up items, with the angled shoe racks on both sides, storage drawer, and a chrome-finished bar for hanging items. The whole wardrobe is on easy-gliding, lockable casters, so your child can move the mobile closet to any room he or she wants to play in. The wardrobe is scratch-resistant and easy to clean. 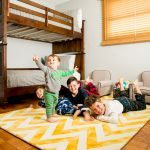 With the study construction and timeless shape, it is sure to last years and years and to grow with your child and their needs. In addition to being great for dressing up, the mobile closet is an excellent way to store everyday clothing items or outfits for school. 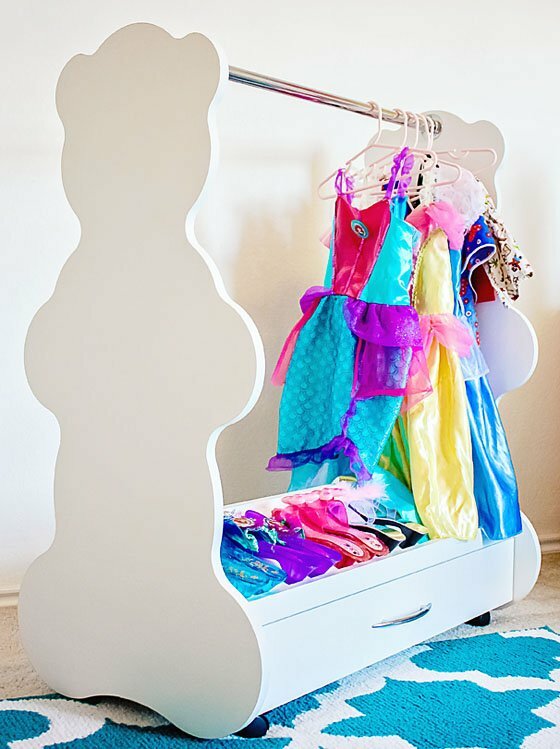 Help your child learn to keep their belongings tidy and organized by allowing them to put away and choose their clothes, shoes and accessories! The adorable designs include a bear, a rabbit and a lion and the mobile wardrobe is available in black, cherry, espresso and maple, so you are sure to find a wardrobe that blends seamlessly with your decor. 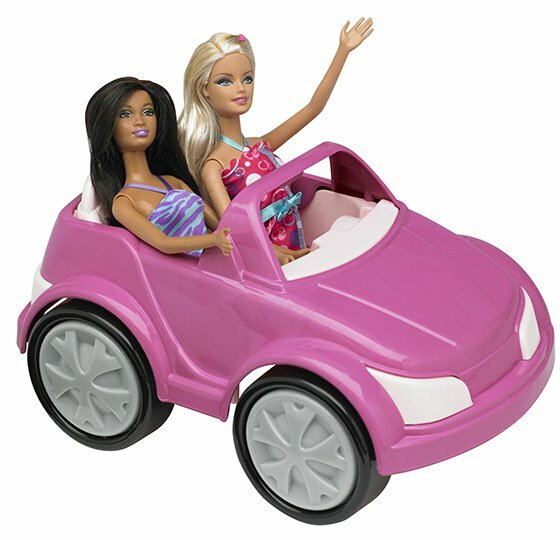 Many little girls have fashion dolls on their wish list this holiday, and a doll coupe by American Plastic Toys is the perfect accessory gift! 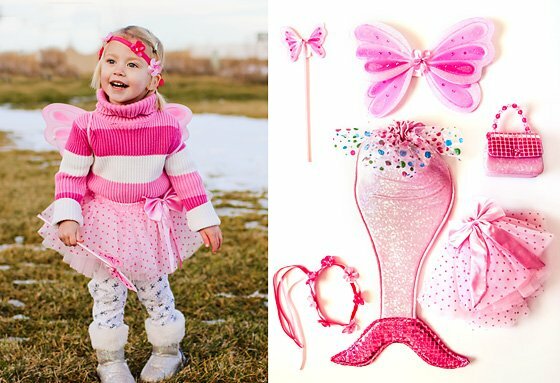 Your little girl will enjoy hours of imaginative play with this sporty, pink doll coupe that fits fashion dolls up to 12″ tall. 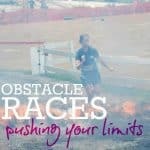 Encourage the notion that cars are for girls, too! She can whisk her dolls away to exciting destinations in this coupe and pretend to go anywhere her mind can take her. 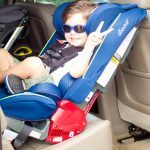 This coupe comes in one piece with no assembly necessary and is appropriate for children ages three years and up. 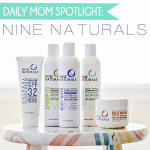 It runs smoothly on hard and soft surfaces and is made here in the United States. 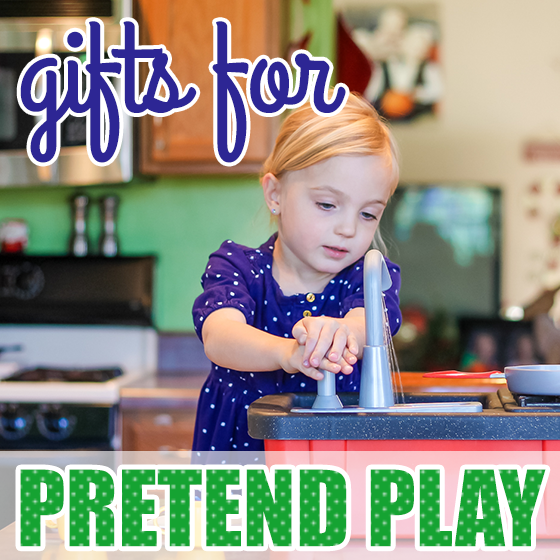 With pretend play gifts, the possibilities are endless. Surprise and delight your little ones with fascinating gifts to inspire their creative and enhance their learning-all while having a great time!